Parachute missions. Poverty tourism. Vacationary. These descriptors are frequently invoked to characterize and critique a misguided (western) approach to missions — an approach that many say encourages an unhealthy dependency and paternalism. When it comes to most popular approaches to short-term missions (STMs), Chris Ellis agrees. Ellis, who serves as minister of mission and outreach at Second Baptist Church in downtown Little Rock, Ark., has lived and studied the subject extensively as a key leader in and co-founder of the South Africa Ministry Network, a consortium of Cooperative Baptist Fellowship congregations launched in 2009 to work with and support CBF field personnel who serve and partner with local ministries in South Africa. “Short-term missions often do more harm than good, especially when the primary purpose of the trip is the fulfillment of the trip itself,” according to Ellis. With more than 1.6 million Americans over the age of 18 going on a short-term mission trip each year, Ellis, whose recent doctoral dissertation is titled Short-Term Missions — Long Term Change, wishes to see STMs made as “missiologically sound” as possible for both participants and those receiving teams. “As STM trips are currently being implemented, they often do not lead to changed lives,” Ellis explained. “Research suggests that participants do not sense increased vocational calling, increased connection to mission at one’s home or increased connection to the global missions movement. This lack of ‘changed life’ is often connected to three main factors: lack of in-depth training of participants, learning transfer or the incongruity of the international STM experience with one’s home life and a lack of skilled STM facilitators. 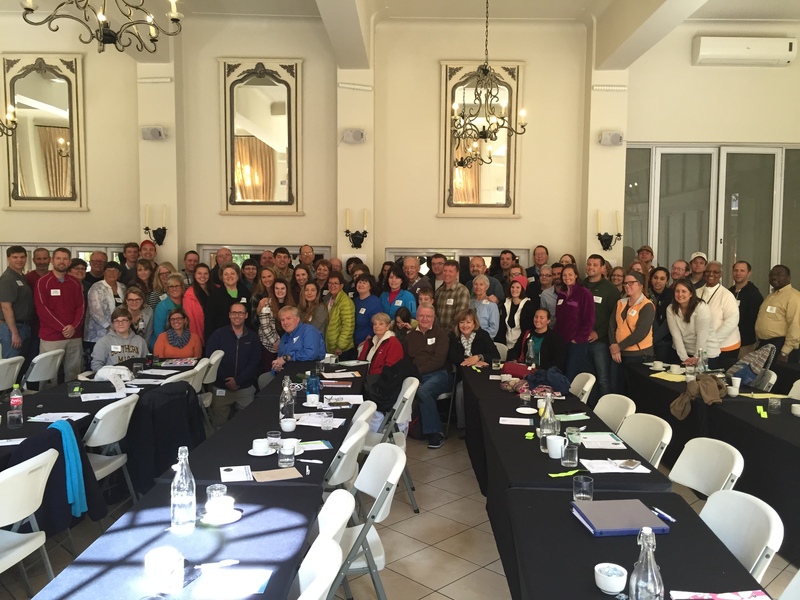 Together, Ellis and the leaders of the South Africa Ministry Network are offering a reimagined model for short-term missions. “The South Africa Ministry Network is trying to embed the short-term mission trip in a much larger narrative,” Ellis said. “We’re not going to South Africa this year, Peru next year and somewhere else the year after that and the year after that. We’re going back to the same place over and over and over again, seeing and creating relationships with folks who are on the ground and sharing life with them as much as we can. To prepare his church members for a trip, Ellis leads a five-session discussion and study on the mission of God, global Christianity, the history of South Africa and the present challenges that the post-apartheid “Rainbow Nation” faces. Participants also spend time getting an advance glimpse of the work being done by the network’s partners in South Africa and receiving a devotional guide that begins a week prior to their departure. While on the trip, participants take part in nightly debriefings — opportunities to reflect on God’s work in the world and their place in it. Stephen Cook, senior pastor of Second Baptist Church in Memphis, Tenn., a member congregation of the network, says the consortium of CBF churches knows its role is not to “fix” anything, but to take part together in the renewal of God’s world. “We know we are not going to ‘fix’ anything,” he said. “We are going [on these short-term] trips to come alongside of and be involved with what God is doing in that part of the world. We know our limitations and that we cannot and should not be responsible for determining outcomes. Rather, we are there as ones who believe that God is at work in more places than those we call home. We invest the time, resources and energy we do in order to participate in that which is larger than ourselves. CBF Moderator Matt Cook, who serves as senior pastor of First Baptist Church in Wilmington, N.C., another network member, points out that short-term missions have the potential for much good. To keep this intentional focus, he notes that the network strives to offer care for the caregivers. Now in its sixth year, the network has helped provide financial support for four partner-funded CBF field personnel and made significant investments in the ministries of the Refilwe Community Project, a Christian organization in Johannesburg that provides a home for orphaned and neglected children as well as a baby house for abandoned infants. Refilwe also hosts a medical clinic, preschool, kids club and after-school programs for its impoverished community. The network led a group of just over 70 Baptists in July on a week-long mission experience in Johannesburg as well as at mission sites 250 miles southeast in the Winterton area of the KwaZulu-Natal province, a rural region heavily impacted by the HIV/AIDS epidemic. The hands-on trip culminated with the group taking part in the 21st Baptist World Congress in Durban, South Africa, the quinquennial global gathering of the Baptist World Alliance. The network also looks for opportunities to convert mission trip dollars to ongoing support, Matt Cook said, noting that the network sets aside a portion of trip costs to help pay for the salaries of part-time care workers of the Bophelo Medical Clinic at Refilwe. Ryan Clark, church engagement manager for CBF Global Missions, says that the missing ingredient in many short-term missions has been the relationship — and not the kind of relationships where one person or group makes all the decisions. “What CBF churches in the South Africa Ministry Network have discovered is a beautiful balance of power and resources with an eye on the long-term transformation of communities,” Clark said. When the twin Viking landers became the first spacecraft to set down on Mars in 1976, they relied on parachutes to slow down after punching through the Martian atmosphere. Ever thought about joining us?